Following the undertaking of specialist training by members of its team, Emmerson Critchley Ltd produces and supplies high quality daub. 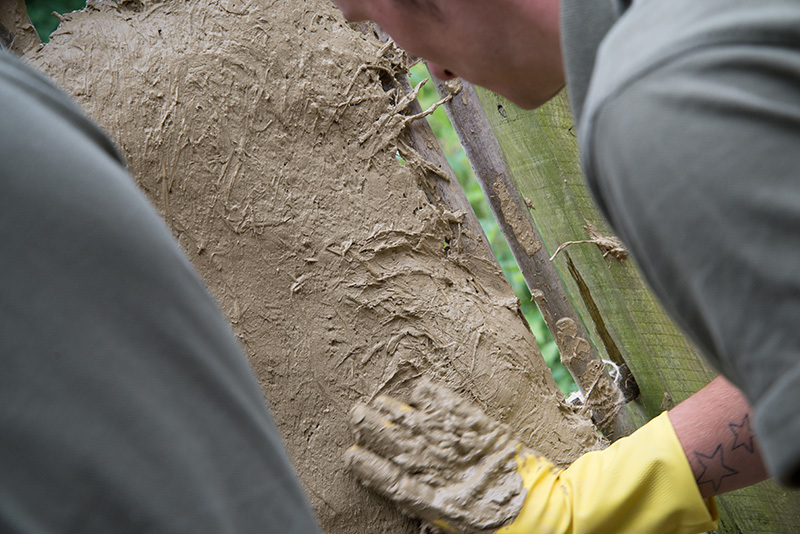 The team’s training was led by Paula Sunshine, an authority on daub and author of ‘Wattle and Daub’, as well as alumni of The Prince’s Foundation and recipient of the prestigious Hancocks Medal (presented by HRH The Prince of Wales) for her work with lime. Daub – a composite building material usually used for coating a surface or, when mixed with straw and applied to wattles or laths, to form a wall – is used extensively by the Emmerson Critchley team. Normally constituting clay or plaster, an added benefit of producing daub is that it is an extremely efficient means of recycling otherwise unwanted clay and other materials, which also fits in well with the Emmerson Critchley ethos. Clients of Emmerson Critchley will also be pleased to learn that the in-house daub production also cuts out the additional cost of acquiring it from a third party and happily, this saving is being passed on to Emmerson Critchley customers. The daub is made on demand with supplies also kept in stock – prices are available on request and depend on the amount required. To get a quote or find out more, please contact us.